There are going to be scratches and dents on your dorm desk from previous college students. Unfortunately, you can't get a new dorm desk. You're going to end up staring at those scratches and becoming quite distracted by them in the middle of working on your homework. You don't have to deal with starting at those scratches for the whole year! 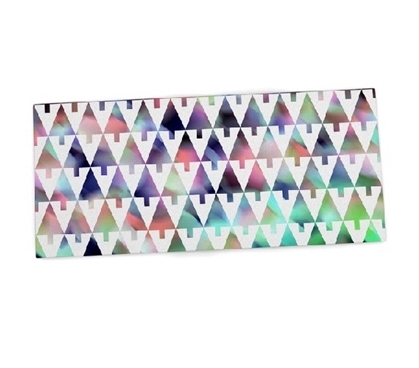 In fact, you can cover them up and prevent new ones from occurring with our Holiday Party Geometric Desk Mat! Our Holiday Party Geometric Desk Mat is resistant to dents, stains, and scratches and will cover up the ones that already on your dorm desk so you can add to your dorm room decor instead of detracting from it. Our Holiday Party Geometric Desk Mat will add fun flair to your dorm room decor. Featuring alternating white triangles and colored triangles with bright aqua, purple, and pink watercolor style flow, this dorm essentials item will add fun flair to your dorm desk. You will be customizing everything else in your dorm room, so make your dorm desk part of your customization with this Holiday Party Geometric Desk Mat! You're going to get more than just cool style with this dorm item. You're also getting comfort. Yes, you can have comfort at your dorm desk! Made of soft, non-skid neoprene, this dorm necessities item will be a comfortable, cushioned surface to prevent your hand and arm from becoming tired from writing.